On the morning of June 15, 1991, Mount Pinatubo on the island of Luzon in the Philippines exploded in the largest volcanic eruption on Earth in more than three-quarters of a century. The most powerful phase of this cataclysmic eruption lasted more than 10 hours, creating an enormous cloud of volcanic ash that rose as high as 22 miles into the air and grew to more than 300 miles across, turning day into night over central Luzon. Falling ash blanketed an area of thousands of square miles, and avalanches of hot ash (pyroclastic flows) roared down the slopes of the volcano and filled deep valleys with deposits of ash as much as 600 feet thick. Before the cataclysmic eruption, about 1,000,000 people lived in the region around Mount Pinatubo, including about 20,000 American military personnel and their dependents at the two largest U.S. military bases in the PhilippinesClark Air Base and Subic Bay Naval Station. The slopes of the volcano and the adjacent hills and valleys were home to thousands of villagers. 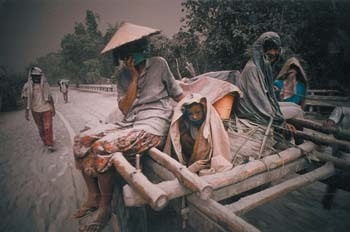 Despite the great number of people at risk, there were few casualties in the June 15 eruption. This was not due to good luck but rather was the result of intensive monitoring of Mount Pinatubo by scientists with the Philippine Institute of Volcanology and Seismology (PHIVOLCS) and the U.S. Geological Survey (USGS). The first recognized signs that Pinatubo was reawakening after a 500-year slumber were a series of small steam-blast explosions in early April 1991. Scientists from PHIVOLCS immediately began on-site monitoring and soon declared a 10-kilometer- (6-mile-) radius danger zone around the volcano. They were joined in a few weeks by USGS scientists from the Volcano Disaster Assistance Program, a cooperative effort with the Office of Foreign Disaster Assistance of the U.S. Agency for International Development. The USGS scientists brought with them specially designed, portable instruments, which the joint Philippine-American team used to quickly set up monitoring networks on and around Mount Pinatubo. The team also conducted intensive studies of the volcano's past eruptive history. When the data from these efforts indicated that a huge eruption of the volcano was imminent, the joint team issued urgent warnings. These timely forecasts enabled civil and military authorities to arrange the evacuation of people and aircraft and other equipment to safe areas before Mount Pinatubo exploded on June 15. The USGS and PHIVOLCS estimate that their forecasts saved at least 5,000 lives and perhaps as many as 20,000. The people living in the lowlands around Mount Pinatubo were alerted to the impending eruption by the forecasts, and many fled to towns at safer dis tances from the volcano or took shelter in buildings with strong roofs. Additionally, more than 15,000 American servicemen and their dependents were evacuated from Clark Air Base prior to the June 15 eruption. In the eruption, thousands of weaker roofs, including some on Clark, collapsed under the weight of ash made wet by heavy rains, yet only about 250 lowland residents were killed. Of the 20,000 indigenous Aeta highlanders who lived on the slopes of Mount Pinatubo, all but about 20 were safely evacuated before the eruption completely devastated their villages. Some might have left on their owntroubled by the steam blasts and earthquakes that preceded the eruptionbut most would have remained had it not been for the forecasts and government-led evacuations. In addition to the many lives saved, property worth hundreds of millions of dollars was protected from damage or destruction in the eruption. 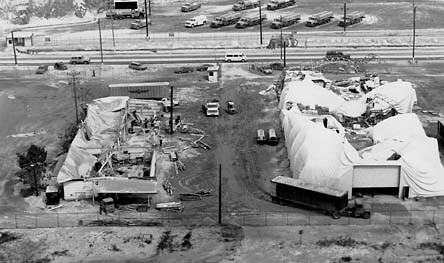 When aircraft and other equipment at the U.S. bases were flown to safe areas or covered, losses of at least $200 to 275 million were averted. Philippine and other commercial airlines prevented at least another $50 to 100 million in damage to aircraft by taking similar actions. By heeding warnings of hazardous volcanic ash clouds from Pinatubo, commercial and military pilots avoided severe damage to their aircraft and potentially saved hundreds of lives. Other commercial savings are harder to quantify but were probably less than $100 million, and there is no way to estimate the sentimental or monetary value of the personal property saved by families. PHIVOLCS and USGS scientists spent less than $1.5 million responding to Mount Pinatubo's reawakening and forecasting its June 15, 1991, eruption, including salaries, helicopter and other logistical support, and the replacement of equipment destroyed by the eruption. Their forecasts were made possible by previous work in the area by PHIVOLCS and by the USGS' mobile monitoring capability, also available to respond to volcano crises in the United States. The costs of these earlier efforts can be roughly estimated at $15 million (10 percent of the combined 1980&endash;90 volcano hazards budgets of PHIVOLCS and the USGS). Additionally, the Philippine and U.S. Governments and nongovernmental organizations together spent about $40 million to evacuate, house, and feed local residents and American military personnel and their dependents. Were These Efforts a Good Investment? 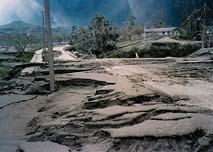 The monitoring of Mount Pinatubo in 1991 and the successful forecasting of its cataclysmic June 15 eruption prevented property losses of at least $250 million (this figure is intentionally conservative and should be considered a minimum value). No monetary value has been placed on the more than 5,000 lives saved, although other cost-benefit analyses have used values from $100,000 to $1 million per life. Even when the costs of developing the portable monitoring capability and of the earlier studies of Mount Pinatubo are included, the total costs of safeguarding lives and property from the volcano's June 15, 1991, eruption were only about $56 million. The savings in property alone amounted to at least five times this total investment! Although savings may not always be as dramatic as those realized at Pinatubo, many lives can be saved and major property losses avoided in other volcano crises through similar relatively modest investments in volcano monitoring and eruption forecasting. 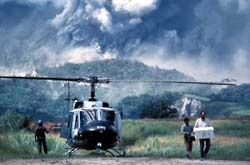 The experience gained by scientists during Pinatubo's 1991 eruption crisis is being used by the USGS Volcano Hazards Program in the United States and by PHIVOLCS in the Philippines to better protect people's lives and property from the future volcanic eruptions that will inevitably occur. Also, visit the Cascade Volcano Observatory on the Web.